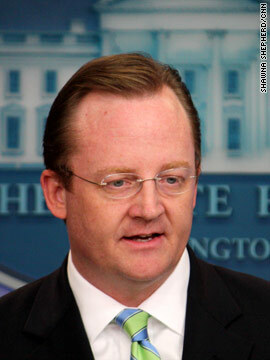 Washington (CNN) – White House Spokesman Robert Gibbs said Monday that Friday will be his last day on the job. Gibbs announced his decision to leave in January. He will continue as an adviser to the president after he leaves the White House. Jay Carney, the current communications director for Vice President Joe Biden, will succeed him at the podium. 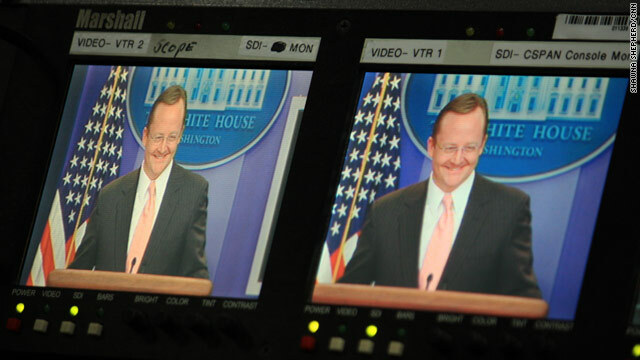 WASHINGTON (CNN) - Press Secretary Robert Gibbs had two very special guests today at the White House: Emily Sparrow and Elaine Rutland. Or as he more likely refers to his high school government and economic teachers – Ms. Sparrow and Ms. Rutland. WASHINGTON (CNN) - After no briefing yesterday, this afternoon's White House briefing was the first opportunity since Monday to get more details about the White House's views on the events in Egypt. 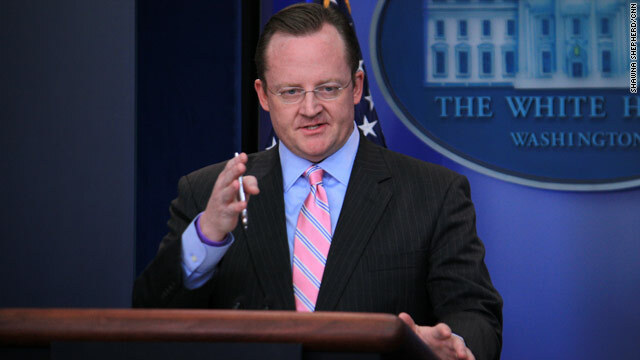 While 95 percent of the hour-long briefing was about the situation in Egypt, Robert Gibbs did touch on several domestic issues, including the massive snowstorm hitting much of the U.S.
WASHINGTON (CNN) - The originally scheduled briefing was supposed to be held this afternoon at 2:30 and include updates on the massive snow storm. But due to all the happenings in Egypt this afternoon, Gibbs indefinitely postponed the briefing and then canceled it when the White House announced President Obama will be making a statement. So no there won't be a serving of Briefing Bites today! 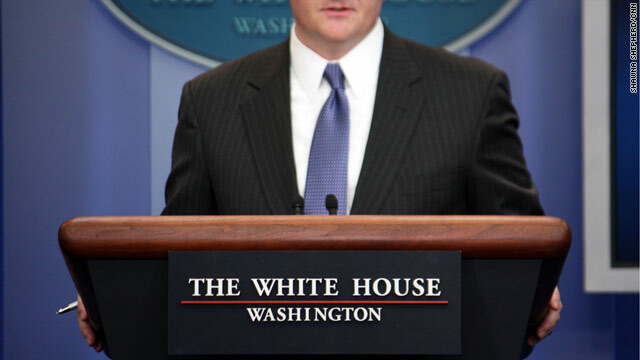 WASHINGTON (CNN) - White House Press Secretary Robert Gibbs held his briefing this afternoon- the only public update we'll get from the White House in reaction to today's events in Egypt. While most of the briefing focused on Egypt, a couple of other topics came up too. 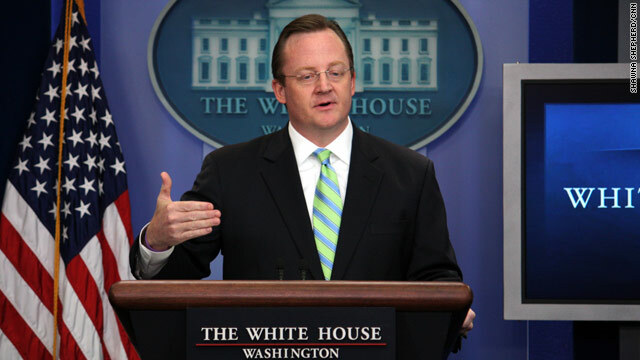 WASHINGTON (CNN) - White House Press Secretary Robert Gibbs told reporters Friday that the U.S. is reviewing its aid to Egypt in the wake of the violent protests taking place in the country. "We will be reviewing our assistance posture based on events now and in the coming days," Gibbs said. In the carefully worded press conference, Gibbs also revealed that President Obama hadn't spoken with Egyptian President Hosni Mubarak. The president "has not made specific calls on this...We continue to monitor [the situation]," Gibbs said. He added that the White House is "deeply concerned about the images and the events we see in Egypt today." When asked why the president hadn't contacted the Egyptian leader, Gibbs said "We are - again, we're monitoring a very fluid situation." WASHINGTON (CNN) – Vice President Joe Biden's communications director, Jay Carney, was named the new White House press secretary Thursday as part of a series of other big staff moves announced by new Chief of Staff Bill Daley. 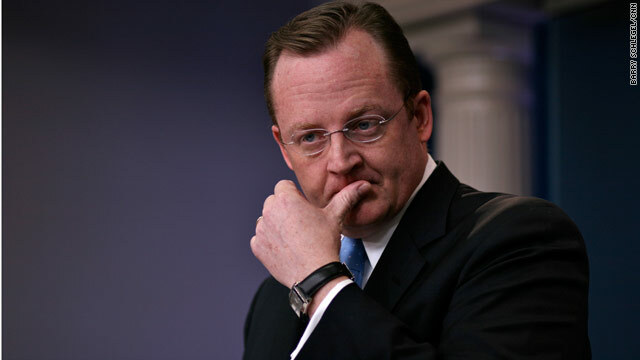 Carney, a former Time magazine reporter, will succeed Robert Gibbs as the most visible spokesman for President Barack Obama. Other White House aides who have been considered for press secretary include Bill Burton, Stephanie Cutter, Josh Earnest and Jen Psaki. Several Democratic sources said that based on the private deliberations inside the White House, Carney was the clear front-runner for the job. 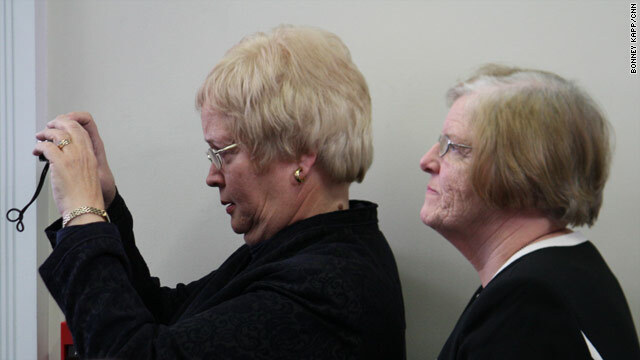 One of the sources said the job was "totally lined up for Jay" before Daley was named chief of staff this month. Then Daley reopened the process to more candidates to make sure they were making the right move, and that second round of considerations has come to a close with Carney at the top of the list, the source said. 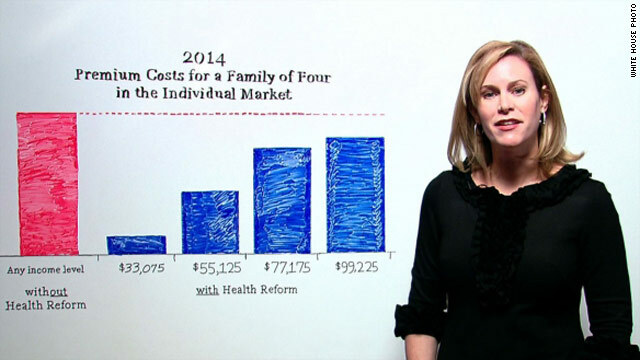 Check out the complete story on CNN's Political Ticker. 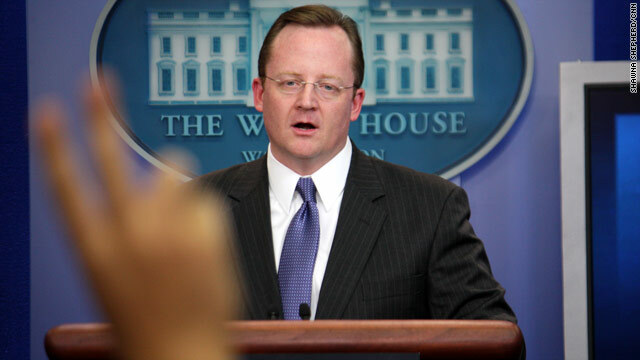 WASHINGTON (CNN) – While the guessing game continues over who will take the podium after White House spokesman Robert Gibbs officially steps down, Gibbs told CNN a replacement has "not yet [been] picked." Names in the mix for press secretary range from current White House deputy press secretaries Bill Burton and Josh Earnest, to Vice President Biden spokesman Jay Carney and Stephanie Cutter, a trusted Obama adviser. WASHINGTON (CNN) –It was what diplomats might call a "frank exchange of views," as White House spokesman Robert Gibbs got into a Cold War-style tiff with a Russian reporter Thursday about whether American freedoms go too far and may have led to the tragic shooting in Tucson. In one of the most surreal moments I have ever seen in nearly seven years covering the beat, Andrei Sitov of the Itar-Tass News Agency pressed Gibbs at his daily briefing about whether "the quote, unquote 'freedom' of a deranged mind to react in a violent way is also American" like the freedom of speech and the right to assembly. Gibbs, clearly ticked off by what appeared to some reporters in the briefing room to be a lecture by the Russian reporter just days after the horrific massacre in Tucson, bluntly declared that the tragedy was caused by the "deranged actions of a madman." Washington (CNN) – President Obama and his wife returned to the White House early this morning after attending the memorial in Tuscon for the shooting victims. The President will meet privately with senior advisors in closed press meetings so we do not expect to see him today. Gibbs will brief at 10:15am. At least at this point he is scheduled to brief at 10:15am. We'll see if it actually happens at that time. I mean he too got back early this morning from Tucson.